Cooper Wiring Device Arrow Hart® 2-Gang mid size specification grade combination wallplate in ivory color, has high gloss finish and polycarbonate construction for durability. Wallplate with 0.08-Inch thickness, measures 4.94-Inch x 4.87-Inch. It has a cutout size of 0.4-Inch x 0.93-Inch for toggle, 1.34-Inch x 1.13-Inch for duplex receptacle. 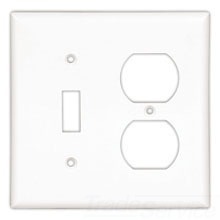 Screw mountable wallplate features 1-toggle switch and 1-duplex receptacle configuration. It withstands a temperature ranging from -40 to 158 deg F. It is suitable for industrial, institutional and other high-traffic areas. Wallplate meets UL 514D, File No. E33216, cUL, UL File E33216, cULus and RoHS standards.